fd2s has worked with the University of Kansas Health System for approximately 15+ years. Working alongside UKHS leadership and with Cannon Architects and the owner’s rep, NV5, fd2s developed the exterior and interior wayfinding system that carries on the visual aesthetic we developed over a decade ago. This new wayfinding system will function across the growing UKHS system, including a numbering system for the 4x expansion of an 11-story building on the U of K Medical Center Campus. 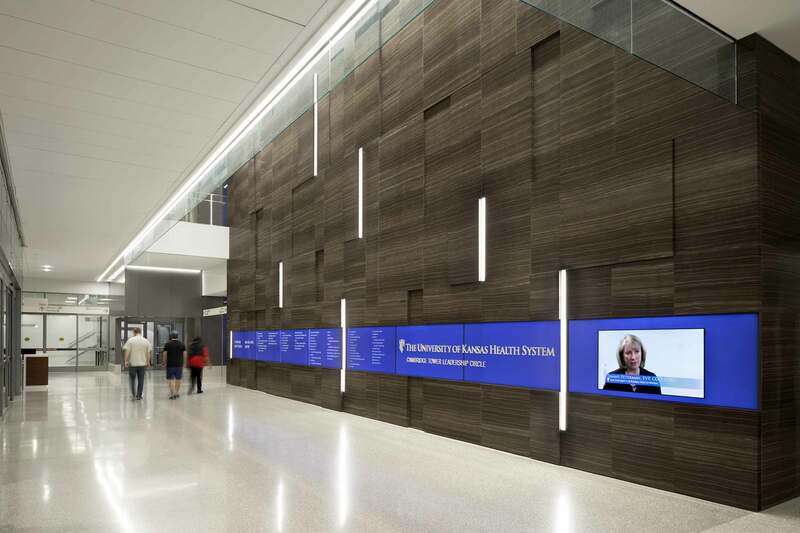 fd2s also permanently integrated the donor recognition focal point with the lobby’s stone feature wall, and built-in adaptability so the installation can evolve over time. To match the blue glass used throughout the building, fd2s conceived a custom printed color for the installation that looked equally striking both with the backlighting and without.